This 4,899 hectare provincial park is located on the west bank of the Fraser River. It provides good representation of moist hot and dry sub-boreal spruce forests. 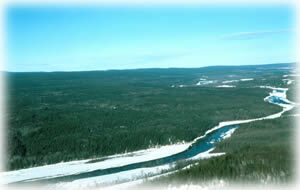 The area has high wildlife values and provides excellent deer and moose winter range. Natural Feature: Good representation of moist, hot and dry, warm Sub-boreal Spruce forests. There are no facilities provided at this park. The park is located on the west bank of the Fraser River, on Hwy 97 South, approximately 35 km from Prince George. Horses are allowed in the park but access is difficult. Hunting is allowed in this park. Please check the BC Hunting & Trapping Regulations Synopsis for more information.